Dr. Natalie Lockney (left), Assistant Professor, Radiation Oncology, will join the UF Health Cancer Center Women’s Cancer Wellness Symposium at the Hilton University of Florida Conference Center on Thursday, March 14, 2019. Tea and refreshments will be served. The symposium, scheduled from 2 – 4 p.m., will feature three presentations by UF Health providers about women’s cancer prevention, treatment and research. Dr. Lockney will discuss intraoperative radiation (IORT) for breast cancer patients. IORT delivers a dose of radiation at the time of lumpectomy, while the patient is still under anesthesia, which helps patients complete the therapy and return to their normal routines sooner. 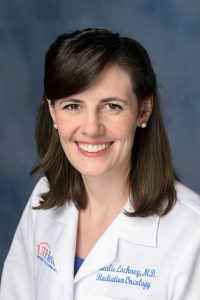 Edlira Maska, MD, Assistant Professor, Internal Medicine, will review cancer prevention and screening options for women. Tiago Machuca, MD, PhD, an Assistant Professor of Surgery at the University of Florida College of Medicine, will discuss current novel treatment options available at UF Health and minimally invasive robotic surgery for lung cancer patients. Clinical Trials Coordinator Leslie Pettiford, RN, will provide an overview of clinical trial myths and options. She will then moderate a Q&A session regarding clinical trials currently open at the UF Health Cancer Center with Dr. Merry J. Markham and Dr. Karen C. Daily. A Women’s Cancer Wellness Health Fair will also take place from 1 – 2 p.m., with booths featuring women’s wellness services from a variety of UF Health providers. Registration is required. Visit ufhealth.org/events/womens-cancer-wellness-symposium, or call 352-733-0000.